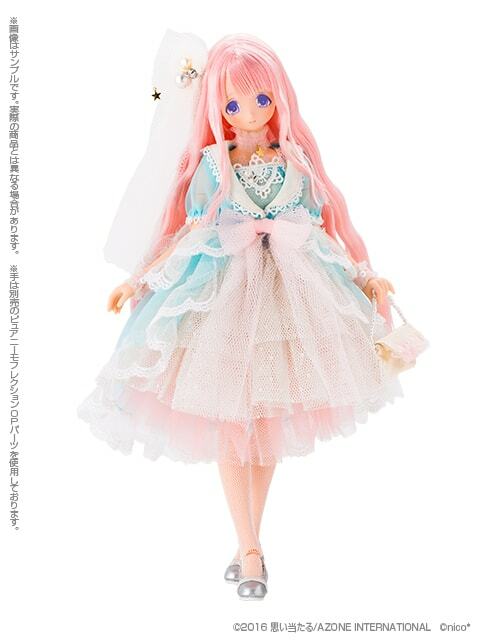 If you’re fond of princesses, mermaids and dolls with pink hair then you'll love Azone International's 9th doll from the EX-Cute Fairyland series. 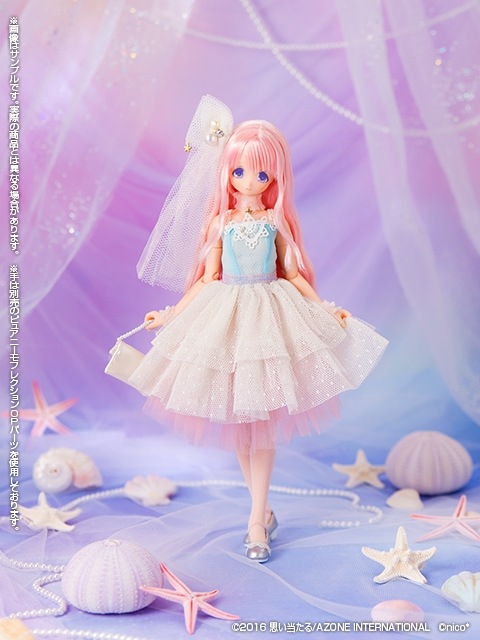 Her name is Mermaid Princess Minami and she'll be making her way into the hands of collectors June 2016. Pre-Order Begin June 9, 2016. EX-Cute's Fairyland series features doll designers/creators who draw inspiration from fairy tales to transform the EX-Cute Friends and Family into stunning fairytale theme dolls. 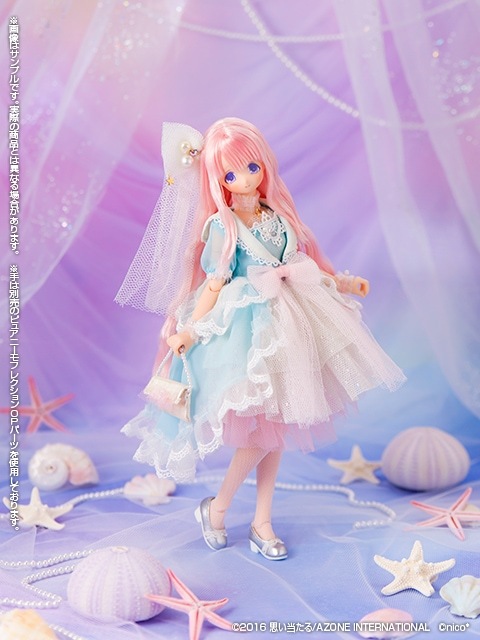 You may remember seeing Mermaid Princess Minami at Wonder Festival 2016 Winter. Many fans were super excited about seeing Minami as a mermaid and now the wait is finally over. 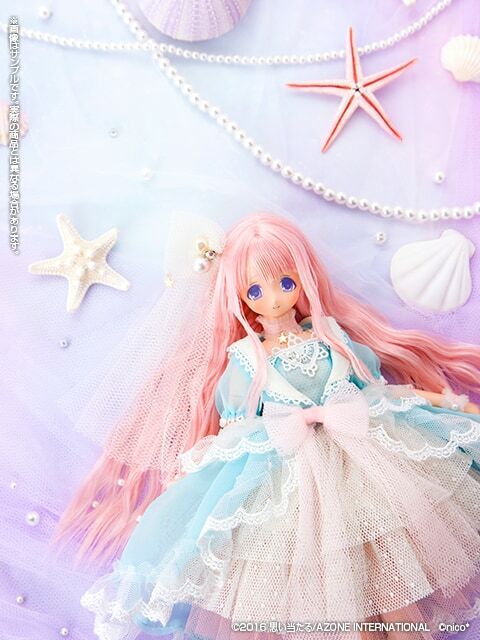 Mermaid Princess Minami is a collaboration between Azone International and the talented doll designer Nico*. At the bottom of the ocean lived a beautiful mermaid princess in a castle made of coral. One day, the fish near the surface were making lots of noise. When the princess swam up to investigate, she saw a school on the nearby coast with lots of girls in attendance. "Wow! That looks like a fun place!" She thought, gazing starry-eyed at the girls. Just then, one of the girls turned and looked in her direction. Here's addition information about the design inspiration. A collaboration between nico* (illustrator and custom doll maker) and Miss Minami of the Ex☆Cute Family! She wears an aqua-blue sailor chiffon gown inspired by the crystal sea in which she dwells. The tiered one-piece swimsuit underneath invokes the image of waves and is accentuated by a coral-pink pannier. Oh, what an adorable story. What's going to happening next? Be continues drive me crazy with anticipation! Okay, back to the doll. 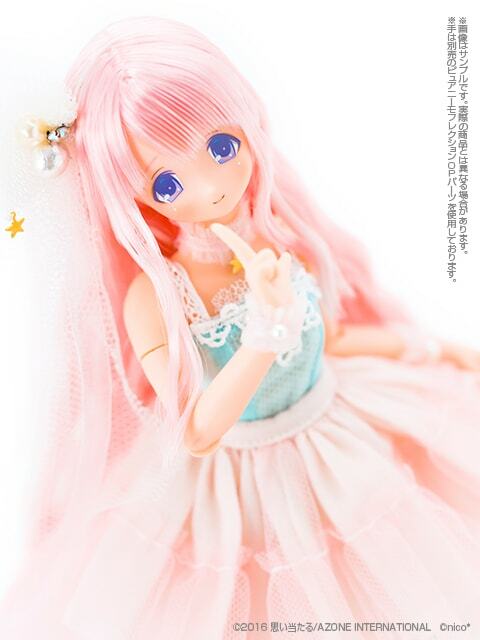 Minami-sensei is such a delicate beauty in her lovely pastel dress. I'm sure you can sense that Minami will sell out quickly. She has so many irresistible qualities, like her long flowing pink hair & complimentary dress. It's going to be a dolly battle to bring her home. 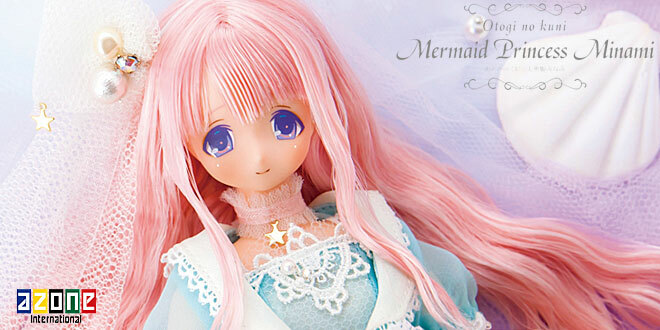 Have Azone International and Nico*’s Mermaid Princess Minami place your heart (and wallet) under an enchanting spell? 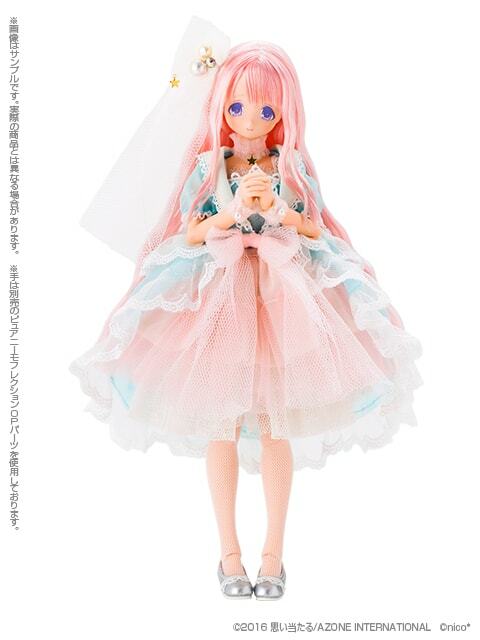 Or will you save your money for another doll? What do you like the most about Mermaid Princess Minami? Please feel free to share your thoughts & opinions in the comment section below. 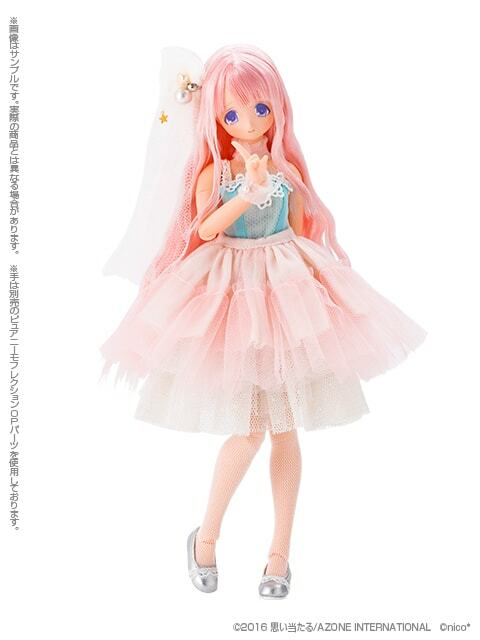 I will probably be at work when this doll pre-order goes up, so I’ll be desperately trying to buy this in a bathroom stall on my phone. May fortune favor me, lol. But it seems to me that you’re armed and ready to go. You got a plan, the equipment (phone), and a location . . .
As long as you stay alert and don’t let anything distract you (like it always seem to happen to me during intense pre-order periods) I think you have a good chance of getting her. Mermaid Princess Minami is very cute. She grows on me everyday. Azone definitely knows how to stretch a collectors wallet (thin). I need to find additional ways to make $$ because Azone is not playing with these releases. We still have 2 more Sahra’s girls, another Lil’ Fairy and I’m not sure if Mermaid Minami will be the last Fairyland EX-Cute or not. If the answer is no, then there goes more $$ to Azone. And I haven’t taken into account their other lines that they’ll be revealing later this year (Hetalia boys, Black Raven series etc.) Whoosh, I’m already exhausted just talking about them. It’s certainly exciting to see what Azone has up their sleeves next. Congrats on Snow White Aika. Please feel free to come back and let us know what you think about her.